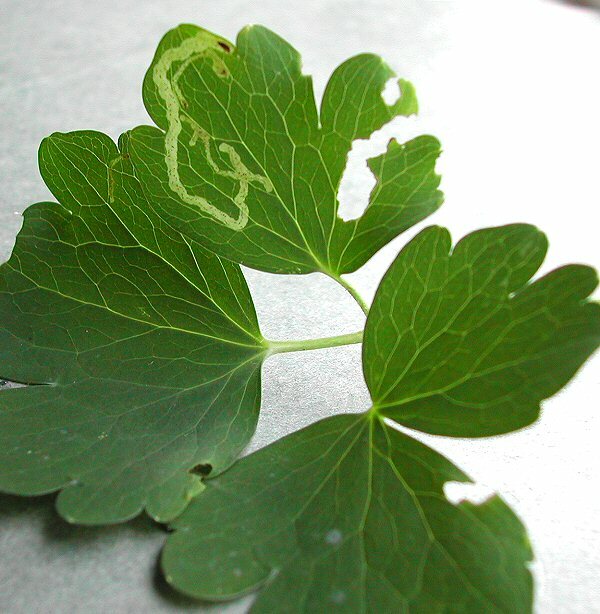 Food Plant: Aquilegia spp., Thalictrum (Meadow-Rue) spp. Mine: Bivoltine: summer & autumn. Notes: A relatively broad, short upper surface gallery (as shown). Frass in conspicuous black stripes. Common and widespread throughout British Isles. Mine shown on Aquilegia. Edmunds R, (2015), Thalictrum delavayi (Chinese meadow-rue): a new host plant for Phytomyza minuscula Goureau, 1851 (Dip: Agromyzidae), Entomologist’s Record and Journal of Variation 127: 278-278. Hering, M (1957) - Bestimmungstabellen der Blattminen von Europa. Robbins, J (1990) - A Provisional Atlas of The Leaf Miners of Warwickshire. Spencer, K A (1976) - The Agromyzidae of Fennoscandia and Denmark. Spencer, K.A (1972) - "Diptera: Agromyzidae" Handbooks for the Identification of British Insects, Royal Entomological Society of London.